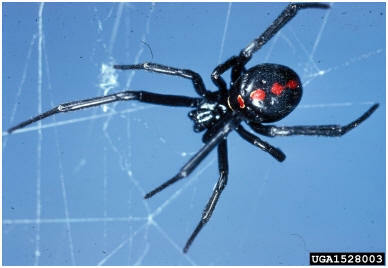 The Latrodectus sp. bite contains poison that is helpful in bringing down prey, but can also be harmful to humans. In the Annals of Surgery an article by H. T. Kirby-Smith MD explains that although the bite of the spider is rarely fatal it can cause extreme abdominal pain which many people fail to realize comes from the miniscule bite that is only felt as a slight sting. An odd thing about the spider bite is the location of the bites. Most bites occur on the lower half of the body, specifically in the genital or the rear end areas because people sustain the bites while using the restroom where the Black Widow Spiders have been known to sometimes hang out due to their preference for protected places. Pain from the bite originates first in the area that experienced the bite, but soon migrates to the abdomen, lower back, and lower chest regions of the body. The onset of the pain after a bite usually occurs within 30 minutes of the bite and can persist for at least 24 hours post-bite. There is no known cure for the bite of the Black Widow Spider other than pain killers until the excruciating pain eventually subsides, usually within three days of the initial bite. The Black Widow Spider is not an especially aggressive spider towards humans and usually cowers in fear when confronted by humans. Most of the bites to humans occur when the spider becomes accidently squished against the body or in the dark when the touch of a human against a Latrodectus sp. web can be confused with the touch of the spider’s prey. Another interesting part of the Black Widow Spider’s bite is that only the female of the species is venomous. The female is equipped with two fangs that are attached to poison glands in the cephalothorax of the spider right behind the eyes. These poisonous glands are surrounding by a thin layer of muscle which is consciously controlled by the spider to allocate how much venom is injected into her prey. 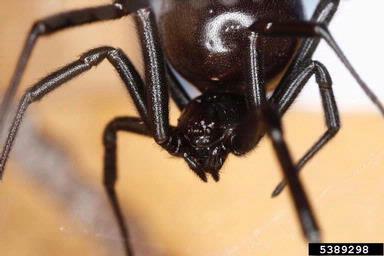 Due to the small amount of venom distributed into the large mass of the human only severe pain is felt, rather than the fatality that beholds other organisms attacked by the female Latrodectus sp. Figure 1. Close up view of a female Black Widow Spider. 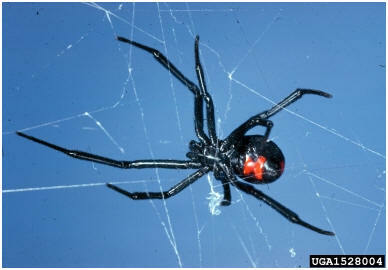 The Black Widow Spider is a black spider with a large red mark on the dorsal side of the abdomen. The spider interestingly enough is not born with this red mark, but instead the dot develops over time, first beginning as just light spots on the spider’s back. As the mark develops it shifts from light colored dots, to a yellow brown and then gradually to red. The different kinds of markings on the spider are often indicators of various muscle attachments beneath the exoskeleton. The coloration differentiation is one of the ways that researchers and scientists from the American Midland Naturalist can tell different species of Latrodectus apart from one another. The different types of colored markings range from very round or rectangular marks compared to marks that resemble more vertical stripes along the posterior dorsal abdomen of the Black Widow Spider. The vertical stripes can also be continuous and whole, or sporadically broken up along a line. Figure 2. Female black widow spider with vertical stripe coloration pattern. Figure 3. Female black widow spider with blocking coloration pattern.